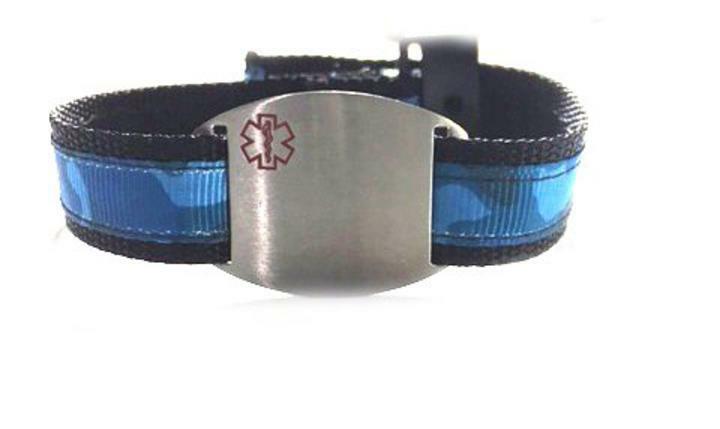 Our new medical id alert sports bands are made of nylon and adorable ribbon print. You select the design you want! We have 38 Designs to select from so far!! The band is 1/2 inch wide and we use a 3/4 center release clasp that way there is a little play in the band and clasp. Medical id alert tag is made of brushed finish hypoallergenic and non-corrosive 316L surgical stainless steel. Band is Adjustable - fits wrist 4-8 inches. Hand washable. Comes with 6 lines of engraving on front with 18 characters per line including spaces and back up to 8 lines with 18 characters per line including spaces.